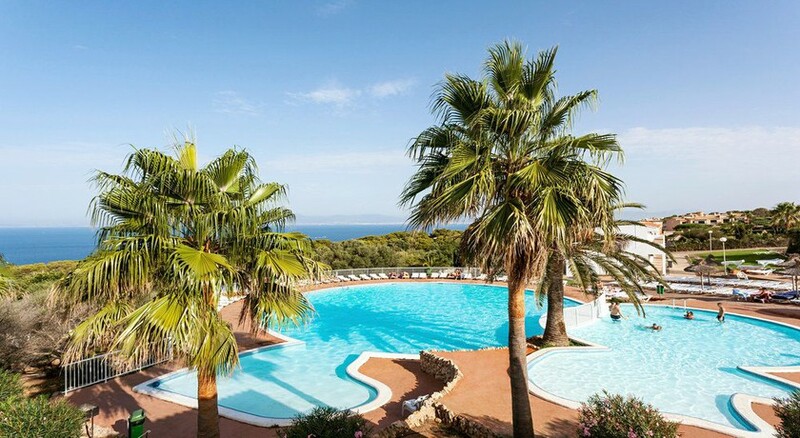 Sitting pretty atop a cliff, overlooking deep blue Mediterranean waters, Sun Club El Dorado is located 11 km from the holiday resort of El Arenal in Majorca. The resort has three pools, including one for kids, where guests can relax on sunbeds and recliners. You can also get a game of tennis, badminton or join an inhouse fitness programme. Sample Spanish treats at the buffet restaurant, grab a drink in any of the three bars and enjoy live entertainment in the evenings. Spread across a green expanse of 60,000 sq m and offering 363 rooms that come with attached balconies, it’s an ideal choice for family-friendly all-inclusive cheap vacations. The Sun Club El Dorado is located 12km from Arenal beach, 9km from Palma airport and 30 km from the city centre. The waterpark Aqualand El Arenal, where kids can enjoy slides and pools, is a 15-minute drive away. Climb down a set of steep steps to reach a platform leading to the sea. The resort has 363 bright, spacious rooms and bungalows that come with balconies or terraces. It offers standard rooms for up to 2 people, superior and family rooms for up to 3 to 5 people and studios, with kitchenette, which are suitable for up to 4 people. It’s ideal for couples as well as families looking for a peaceful retreat. Savour your meals at the buffet restaurant, which dishes out international cuisine, prepared by chefs using local ingredients. Sample drinks, wines, Spanish liqueurs, cocktails and beer at any of the three bars—Saloon Bar, Bar El Barco and Pool Bar. If you’re not an early riser, you can still feast on croissants, pizzas, sandwiches, ice creams and a selection of snacks from 10 am to 9 pm. Standing on a cliff, the hotel features three pools—one for kids and two for adults—where you can lounge on sunbeds, recliners and under umbrellas. Spend time at the fitness centre, take up aerobics, archery, shooting and water polo. The resort features four tennis courts, besides options to play a game of squash, table tennis, badminton and boules. Join a friendly football or beach volleyball match with other guests. In the evenings, you can catch up with parties at the disco and live entertainment. Kids will enjoy the arcade/games room and mini golf court. You can explore horse riding and canoeing in the area near the hotel. Definitely will be back throughly enjoyed. Thanks for a great holiday. We have been coming here for 10 years or more. The staff,food, facilities are marvelous. See you next year. I go back pools where amazing, friendly staff and food was lovely accommodation was rubbish in bungalow but we went on budget holiday well worth the money. I don't have anything negative to say about the hotel. Out room wasn't available on arrival so we were upgraded to a bungalow, which was very nice. The pools are nice (there is a nice spot down next to the see), the food and drinks were good. The staff were very friendly and professional. Amazing value for money and a holiday to remember!! We had 10 days all inclusive holiday at this establishment. Food was lovely staff friendly and amazing views around ! You get what you pay for booking this resort. Is it slightly dated yes, did I arrive expecting anything else, no. We were upgraded on arrival due to the bungalow we booked being too small for our requirements. The bungalow was clean with plenty of clean towels. Great view of the sea from our balcony. Restaurant had plenty of choice although breakfast wasn’t my cup of tea but I didn’t starve. With 3 children and their weird and wonderful appetites they didn’t either! There’s a bus that regularly goes to the nearest beach in S’Arenal and Palma with the stop less than 5 minutes from the hotel reception and both are beautiful. Would book again based on our experience and trying to accommodate children of various ages and interests. Only down side it happened to thunder the majority of time we were there but this couldn’t be prevented and didn’t put a dampener on our holiday. Everything was near to perfect. We saty 1 week with my lady. The bungalow was a bit silly but mere then enougt,the air condition worked. The staff was friendly amd funny. Huge seletoin of programs,the reception helpfully. The food...oh my god! Fresh,delicius and completely different every single day. The traveling is difficult if you want to in to the city,the bus is never coming sadly :/ the best way if pop in to the taxi. Good place for switch off! I liked the resort so much that I have recommended it to my family and friends. The sea view from our bungalow was amazing. We were a minute walk to swimming pool and one of the bars. We enjoyed good food for all the 5 days. Our room was very tidy. It catered for our 2 little girls. Overall we had a good experience.